Seven months through 2016, the health of the U.S. economy remains stable, and the risk of recession remains low. Growth is expected to continue plodding along at a moderate pace. With a 4.9% unemployment rate, we have reached the textbook definition of “full employment.” That puts pressure on wages, which are up 2.6% year-over-year and are growing faster than inflation. Rising inflation-adjusted wages remain a key driver of long-term economic growth because income fuels consumer spending. 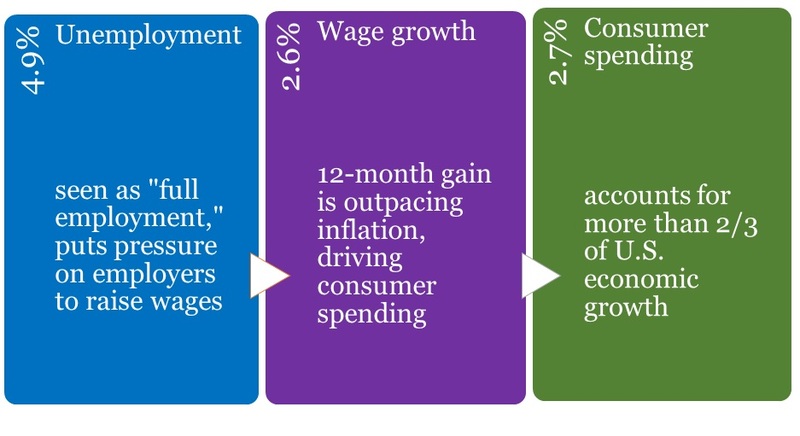 Consumer spending is growing at 2.7% annually, after adjusting for inflation. With more than two-thirds of our economy generated by consumer spending, continued consumer strength should help sustain reasonable expansion at a time when the global economy overall is slowing. Inflation rose 1.6% in the last 12 months, which is below the Fed’s 2% target. Historically, runaway inflation ends economic expansions, but seven years into this business cycle, inflation remains in check. The implications for investors remain straightforward: Maintain a majority allocation in stocks for long-term growth and an appropriate weighting in high-quality, intermediate-term bonds for the confidence to hold on to stocks during periods of short-term turbulence. Long-term, the stock market moves on interest rates and earnings. Interest rates remain low, inflation is low, and businesses buoyed by U.S. economic growth are still profitable – making a relatively healthy environment for long-term investors.